Russian President Dmitry Medvedev plans to attend the ceremony to bid his last farewell to former Russian Prime Minister Viktor Chernomyrdin, the Kremlin said Wednesday. Chernomyrdin died early on Wednesday morning at the age of 72. He will be laid to rest in Moscow's Novodevichy Cemetery on Friday. Medvedev said Chernomyrdin was an extremely popular prime minister and a symbol of changes. "Viktor Stepanovich Chernomyrdin is no more. This is a great loss for our entire country. He was a symbol of the new Russia; together with our new country he made many different decisions, sometimes painful, and served his Motherland his entire life," the Russian leader said in a Kremlin address. "He was a warm-hearted man of great charm and simplicity, open to all. We will remember him," Medvedev said. After serving as prime minister under President Boris Yeltsin from 1992-1998, Chernomyrdin was appointed Russian ambassador to Ukraine in 2001, a post he held until 2009, when he was designated as a presidential advisor. Chernomyrdin was a steadfast supporter of Boris Yeltsin and backed privatization and a number of other reforms, although he started his career by opposing many economic changes. His main contribution to politics was acting as a compromise figure between the free market reformers trying to change Russia and the hardline Communists and nationalists who supported the status quo. He was minister of the oil and gas industries during the late 1980s and helped to turn the ministry into the state-owned gas company Gazprom in 1989. He was the company's first chairman of the board, a post which he retained on-and-off until 2000, and his stake in the company made him one of Russia's richest men. Chernomyrdin is best known in the Russian-speaking world for his colorful use of language and coined the now popular proverb, which can be translated as "we tried our best, you know the rest," uttered after the Russian Central Bank carried out an unsuccessful monetary exchange in the early 1990s. The Russian Embassy in Washington, DC will have a Book of Condolences available for signing at the embassy, 2650 Wisconsin Avenue, NW, Washington, DC, on Friday, Nov. 5, 2010 between 10 a.m. and 5 p.m.
Chernomyrdin was born into a working class family in a Siberian village in 1938. After graduating from the Kuybyshev Industrial Institute in 1966, he went on to work in the Soviet Union's booming gas industry, eventually overseeing the transformation of the Gas Industries Ministry into what would become Russia's most powerful monopoly, Gazprom. As he said himself: "My whole life went by in an atmosphere of oil and gas." In 1992, then-President Boris Yeltsin brought Chernomyrdin into his Cabinet as deputy prime minister in charge of energy, where he faced off with reformist Yegor Gaidar, who was appointed acting prime minister in June 1992, but was ousted six months later. Despite fears from Russia's "young reformers" headed by Gaidar, Chernomyrdin continued liberal reform and implemented a much-needed economic change. He oversaw the strengthening of the ruble and negotiated major loans from the International Monetary Fund (IMF) that would eventually help Russia's economy out of the post-Soviet turmoil. It was as a diplomat that Chernomyrdin scored arguably the most important victory in his career. In June 1995, Chechen rebels took 2,000 civilians hostage in a hospital in the southern city of Budyonnovsk. After televised negotiations between Chernomyrdin and separatist leader Shamil Basayev, the hostages were released. The phrase "Shamil Basayev, we can't hear you, speak up please" joined the stock of the premier's one-liners. Chernomyrdin even had his finger on the nuclear button for 23 hours in November 1996, when Yeltsin was having heart surgery. Despite Yeltsin's trust in Chernomyrdin, he left the post of prime minister in April 1998. "In the spring of 1998, I made a decision: The government should be headed by a different person. We should bid farewell to Viktor Stepanovich," Yeltsin said. "Chernomyrdin's main force is his unique gift for compromise. He can reconcile anyone, he fears no conflict situation. But the thing is: the main compromise that Chernomyrdin has been dwelling upon all these years - the compromise between the market [economy] and the Soviet managerial elite - is not possible any more," Yeltsin wrote in his last book "The Presidential Marathon." Chernomyrdin was shortlisted for the Nobel Peace Prize in 1999 after talks with Yugoslavian President Slobodan Milosevic on NATO's peace proposals as the Kremlin's special envoy to the Balkans. In 2001, in a move that most observers said was surprising, he was appointed ambassador to Ukraine. 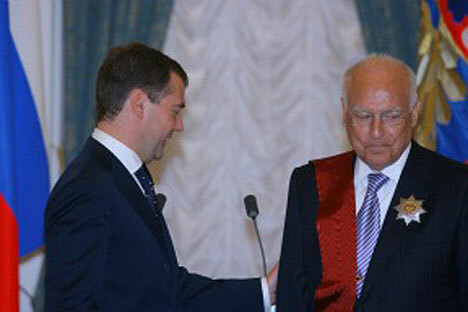 His nine-year stint in that position saw bilateral ties deteriorate to their worst state in decades, with gas disputes and the 2004 Orange Revolution. From 2009, Chernomyrdin was President Medvedev's advisor on relations with Ukraine. Chernomyrdin was known to have been ill for the last year of his life.